Discussion in 'Android Devices' started by jcase, Feb 17, 2011. 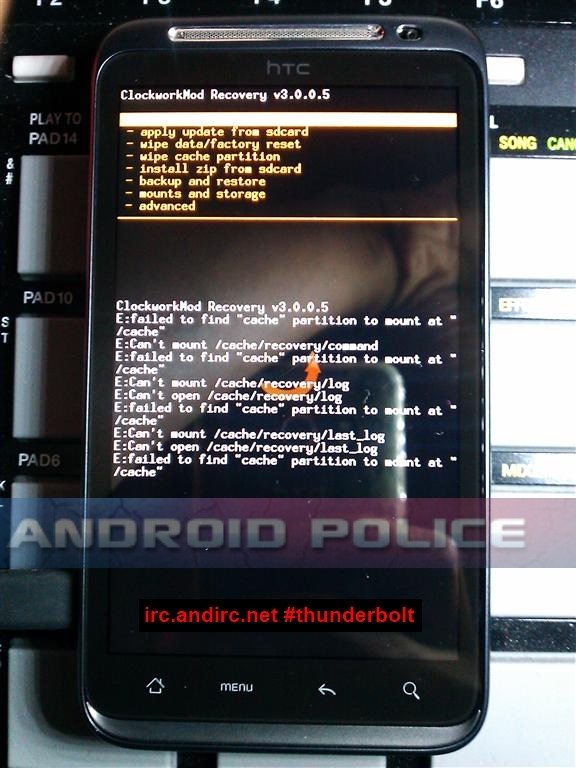 This is a pre-production HTC Thunderbolt that was rooted by the gang at AndIRC. Will be posting details on the root method in this thread, shortly after release. Nothing was done to the bootloader, it shipped with s-off. We don't expect production devices to ship this way, however we do expect to have s-off after rooting it. andrew8806 - for bringing us together. We invite all those interested, especially developers to come work with us. scotty85, djkeller3, jreed2560 and 1 other person like this. Also want to add that per a tweet I got from Cyanogen about CM being available on the phone. Qualcom has released the userspace for LTE so unless HTC does something to mess it up there should be no problems getting some CM love for the phone. Can't wait to get this baby and get it rooted, thanks for the info and as always thank yous to the devs that make our phones so much better! Man I am so looking forward to this, I would live to have CM on this phone, still haven't got to try out a fully working version yet. Only time will tell. Yea CM is one of the main reasons I was looking into this phone to begin with. It is among my check list of things that I need when looking for a new phone. The first being an unlocked bootloader. Also since it is HTC you can almost asure that Cyanogen will be working with it since he loves him some HTC phones lol... In fact I believe there hasn't been an HTC phone released that hasn't gotten the CM love. Please pardon my ignorance: What is CM? Cyanogen Mod, it is a custom ROM (Operating System) built off of the Android source code (AOSP). It adds a lot of functions to the OS and is very nice. Sweet! And btw, I hate you all for having an unlocked bootloader. Okay, I am brand new to Android phones....what does root mean? Rooting means giving yourself administrative rights to your phone. It allows you to do whatever you want. You can delete programs you couldn't normally delete, run special apps that need elevated permissions, and a lot of other customizations. LOL. I can't wait to get my hands on this phone. My bootloader shall be free!!! Are you getting it at release? Didn't know if you had to wait. I really hope so. I haven't heard, nor have they released any information as to the availability of the phone to employees. But since I work at an indirect, we have the ability to put a phone in our own personal inventory so we can take phones out of the store and demo them for customers. If you root the phone does it void your warranty? Will verizon be able to tell that you did this? what if the phone malfunctions for other reasons and then you try to get a free one from verizon? or is there zero risk? i guess my real question is, with the TB being as cool as it is, for a firsttime smartphone buyer, do i really need to root it? Chrizzl3 and zilla. like this. Perhaps the main thing you need to understand about rooting is that, if you choose to do it, your *On Your Own*. From a moral standpoint, you can't do something that voids your warranty, do something wrong with the installation and then take it back to Verizon and say "It's broke!". YOU broke it, so it's YOUR problem as to how to fix it. Now that I've scared you, let me say that this forum and the various other forums are LOADED with friendly, helpful people who will bend over backwards to help you solve any problems you run into. But there shouldn't be any, if you do it right. If you follow the rooting instructions for the Thunderbolt, or any android phone to the LETTER, you shouldn't have any problems. Rooting is pretty easy and straightforward, but you can't think in terms of "If I break it, I'll take it back and get a free new phone". Think in terms of your phone/your responsibility. Chrizzl3 and Speed_419 like this. ok, coming from the droid X im very familiar with rooting but I see the term s-off used which I havnt heard before dealing with the X.... can anyone explain that? Basically having s-off allows you to do on an htc device what we can't do on the X. Load unsigned kernels. ahhh ok I see. thanks for the explanation and link! Getting tired of the release date speculation so I thought I would stop in here. The Thunderbolt will be the first phone I've ever rooted and I'm really looking forward to unlocking the phone's real potential. Also, very thankful for the community in general as I assume I am going to need quite a bit of help. If unrevoked gets behind this device(as the do with most HTC devices) root should be as easy as one click.